There’s nothing like a lying, hatemongering billionaire-slash-reality TV star ascending to the American presidency to leave you questioning the relevance of everything you used to value. How can I go back to promoting my new book, writing new fiction? What does any of that matter now? The media, of course, is already treating this travesty as the new normal. I know I have to call my representatives, sign petitions, attend rallies, volunteer. I need to shoulder up my mantle of privilege and get to work. But yesterday I hit bottom. Depression stole over me like a carbon monoxide leak, and by the time I realized how low I’d sunk, I couldn’t move myself to act. Not to protest. Not to do anything that might make me feel better — yoga class, a warm square meal. So I rode the bus home in the rain, crawled into bed, and cried. The catch about writing a self-help book is that if I don’t try my damnedest to follow my own advice, then I’ll have to live with my hypocrisy (and there’s enough of that going around already). There is a chapter in my book called “Be Your Own Mama,” and the crux is this: when you are upset by the injustices and indignities of life, when you feel rage and exhaustion (no matter the cause), it’s not just permissible to take time out to comfort yourself. It’s absolutely necessary if you’re going to be of use to anyone else. I couldn’t summon the energy for exercise or cooking, but I could lose myself in a good novel. I became a storyteller to give insight and pleasure to people I will never meet, and tonight I needed someone else’s. 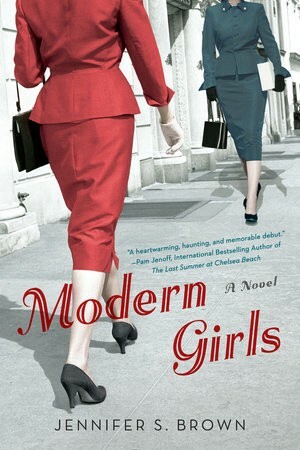 So I picked up my friend Jenny Brown’s novel Modern Girls, which is set in New York City in 1935. The women of the title are Jewish, caught between old- and new-world expectations, struggling to ascend the proverbial economic ladder in the midst of the Great Depression while worrying about their relatives back in Europe who are unable to flee the looming threat of the Nazis. This novel is a far cry from the pure escapism I could have reached for — but it was the perfect choice for a time like this. The hopelessness of my situation, my inability to be both a revolutionary and a mother, filled me with rage. Was this what I was destined to be? Not a fighter, standing up for her beliefs, but a coward running at the first sign of trouble? No, not a coward; a mother. A mother and daughter take turns narrating Modern Girls, both of them grappling with the consequences of unexpected pregnancies. Rose, the mother, knows that if she has her baby, she won’t have the time or energy to return to the social activism that gave her such a sense of purpose when she was younger. Rose writes letters to her representatives and President Roosevelt on behalf of her younger brother, who is increasingly desperate to get his family out of Poland, but he can’t join her in America thanks to the miserly immigration quotas of the 1924 Johnson-Reed Act. All around her, Rose’s friends and family tell her everything is going to be all right, that the Nazis’ hateful rhetoric will lose its momentum. Anti-Semitism has always been a problem, they tell her. Their family back in Europe will survive as they always have. Well, we all know how that turned out. As Hugo Schwyzer wrote on The Times of Israel blog last week, it’s better to be alarmist than to maintain “everything’s going to be all right” only to prove yourself dead wrong. Our con-artist of a President-Elect has announced a white supremacist and anti-Semite as his chief White House strategist. He has told his supporters to stop spray-painting swastikas and attacking people of color in the street, as if he weren’t the one to call those demons out of the depths in the first place. Now is not the time for soothing platitudes. No, we need to figure out how to soothe ourselves while keeping our eyes open and our tongues sharp, disregarding the opinions of anyone who would sneer at our perspectives. Modern Girls is ultimately about the choices we face in the aftermath of one wrong turn — whether your own or someone else’s — making the best possible decisions in light of the one we can’t undo. We are not helpless. I am not helpless. First, I take care of my physical and emotional needs. Fresh vegetables. Yoga. A good cry whenever I need it. A belly laugh at any opportunity for comic relief. And lastly, I’ll remember that the work Jenny and I do is actually more relevant than ever. We’ll keep writing, no matter what.